What is the shortest memory span possible? If I am remembering this right, I think I may have just experienced it. Honestly, I forgot something one second after it happened. How is that even possible? Multitasking, I guess. I’m embarrassed to admit that I don’t remember exactly what may have distracted me while I was putting wood on the fire Saturday morning. Two logs. That’s as complicated as this task was. I opened the fireplace doors and tossed the first one on the remnants of glowing coals. On contact, a red-hot ember popped out and landed right in front of me on the stone hearth. Without hesitation, I chose to place the second piece of wood before sweeping up the errant ember. I leaned forward to place the second half-log on top of the first, balancing myself against the heft by reaching out and pressing my hand firmly onto the hearth. The searing pain of the glowing ember stabbed through my finger as my mind instantly realized what I had just done. One second earlier, I had watch the hazard appear. In the time it took for me to switch to thinking about placing the next piece of wood, I forgot about the ember? Seriously? Is that even possible? It’s embarrassing. Luckily, it is also a little funny, albeit painful. So, I’m laughing over the insanity of it, and sharing it for your amusement, too. If ever there was a “D’oh” moment, this was one. 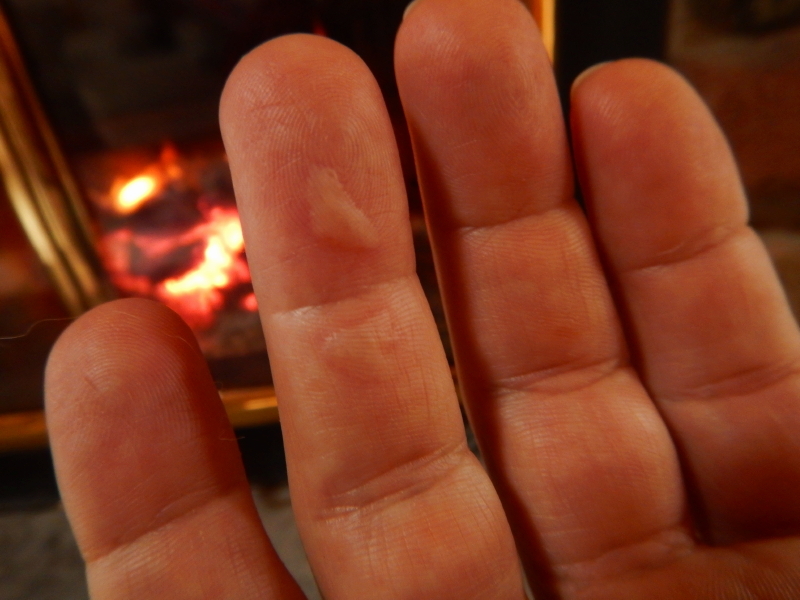 I have no idea how I succeeded in getting burned in two places on that finger, as the ember was about the size of a single blister. Somehow my reflex reaction, after I was able to shift my weight back off that hand, must have caused a double contact. The involuntary curse that erupted was equally a result of the pain, as it was over my having noted, and then forgotten, the ember in such a ridiculously short span of time.